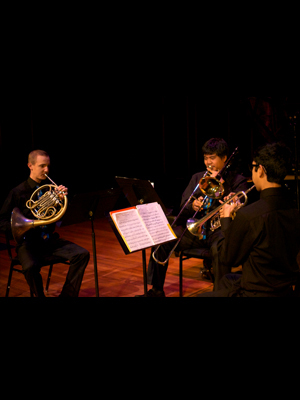 The Merit School of Music Honors Brass Trio performed on NPR’s From the Top with Host Christopher O’Riley, Show 300, recorded in Boston, MA, on February 7, 2015. Merit School of Music Honors Brass Trio is based at the Merit School of Music in Chicago, Illinois, which transforms the lives of Chicago-area youth by providing the highest quality music education – with a focus on underserved communities – inspiring young people to achieve their full musical and personal potential. The trio’s members are 18-year-old trumpet player and Jack Kent Cooke Young Artist Ricardo Zapata from Chicago, Illinois; 18-year-old horn player David Sweeney from Lindenhurst, Illinois; and 17-year-old trombone player Adriel Garcia from Chicago, Illinois. They are coached by Tim Riordan.